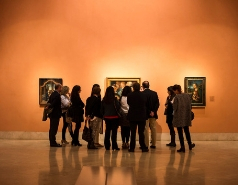 Art lovers have their particular Bermuda Triangle in Madrid, the known as Golden Triangle is a set of the most representative museums in Madrid: Museo del Prado, Museo Thyssen-Bornemisza and Museo Reina Sofía. 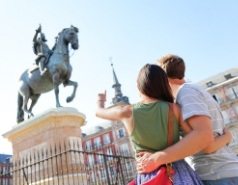 With the tourist bus of Madrid City Tour you will be able to complete Golden Triangle easily. El Prado National Museum has the most extended collections of important artists, as El Bosco, Tiziano, El Greco, Rubens, Velázquez or Goya. In its Galleries you will find pieces as “Las Meninas” (Velázquez); “The Garden of Earthly Delights” (El Bosco) and “The third of March of 1808” (Goya). For reaching this museum, get off at stop 1 of the Madrid Historical route (Museo del Prado) the official tourist bus of Madrid City Tour and contemplate the favourite artworks of the Spanish monarchs of the centuries between 16th and 19th. The Thyssen-Borbenemisza offers the possibility of doing a review through art history, from 13th Century to 20th Century. Between its collections American’s 19th Century paintings stand out. The route Historical Madrid of the panoramic tourist bus will take you to this museum, you will only need to get off at stop 19 (Museo Thyssen). In “Museo Nacional Centro de Arte Reina Sofía” you will have the opportunity of seeing 20th Century works of contemporary art. You will get to know pieces of “surrealism”, “cubism” and “expressionism”. Artworks of the most celebrated Spanish artist of 20th Century, such as Pablo Picasso, Salvador Dalí and Joan Miró. You will be able to arrive there getting off at stop 20 (Museo Reina Sofia) of route Historical Madrid of the hop-on hop-off service of Madrid City Tour. The golden triangle of art is placed in the known ”Art Walk”, considered as one of the places with higher art concentration. This walk includes buildings like the Real Jardín Botánico or Casa America. 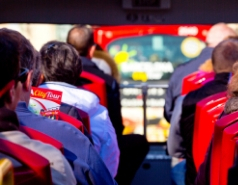 You can make this tour with the official tourist bus of Madrid! Get ready for the most artistic tour in Madrid!